We reviewed the first Gangster School novel and I'm very happy to be back with the sequel, Gangster School 2. Subtitled The Brotherhood Of Brimstone, the second book sees the main characters settled into their school and more settled into who they actually are, and what they stand for. Charlie and Millie aren't exactly cut out for a criminal life, but they are expected to take that path and this is their second year at Blaggard's School for Tomorrow's Tyrants. It doesn't take long before our heroes to discover the reason for some mysterious happenings is not as ghostly as it first appears. This is like Scooby Doo but with a genuinely perilous twist and there are a couple of moments when I wondered how serious things were going to get. The Brotherhood Of Brimstone are on a mission and at least one of them isn't going to let anyone or anything stop him. Luckily they aren't all quite so committed, and Charlie and Millie are keeping a close watch and unfurling their plan. As with all good thrillers and mysteries, will they be able to piece together all of the clues in time to stop the truly bad guys? This is a children's book, so maybe, and maybe they play The Brotherhood at their own game, which leads to some hilarious scenes, although it doesn't go entirely smoothly. The characters really settle into their roles in this book. You feel you know them quite well and they have gained confidence and maturity since their first year at Blaggards. They are clever and manage to avoid most things criminal by sidestepping neatly into something else. It means you are allowed to like them and they stand out sharply from the pupils who really will end up in the darker side of the criminal underworld. The writing is good and the story has great pace, events happen in quick succession and you have a really strong image in your head as you read. The storyline and language are perfect for independent readers aged around 8+, but it's a little dark in places for younger readers. 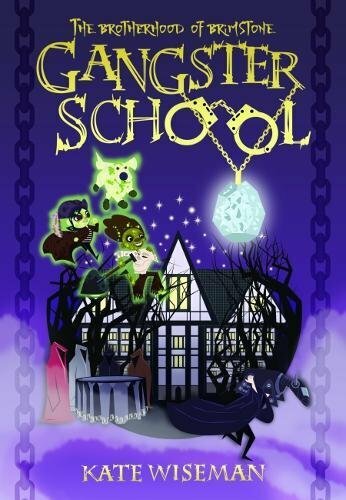 Gangster School 2: The Brotherhood Of Brimstone is published by Zuntold Books, written by Kate Wiseman with cover art by Isla Bousfield-Donohoe. 212 pages, £6.99rrp, which is a very fair price. Available from Monday 24th September from all good bookshops instore and online, including Amazon*. There is a Blog Book Tour if you want to find out what other reviewers thought. You can find them all over on Twitter! We were sent our copy of Gangster School 2: The Brotherhood Of Brimstone for review. *Amazon links are affiliate, so I receive a thank you of a few pence if you buy through my link, but you don't pay any more.